1 - JAMES W BUKY downbound out of lock 18. This is a new boat for the Izona log book! 3 - Take a close look at the Davenport and tell me what is missing! That's right, the starboard stack!! She was moored at lock 18 under repair! 4 - JAMES F NEAL upbound along the bank waiting for her turn in lock 18. 5 - DAVID L GRIGGS downbound, hammer-down shoving out of lock 18. He was putting on quite a show for the Izona Crew! Another new boat for our log book! 6 - BURLINGTON, downbound light boat, Burlington Iowa 03 November 07. Hey Crew! Got to take Izona out for a short trip this morning! What a beautiful day. Caught a few new boats for the Izona log, but thought I'd send this picture of the Burlington first. 7 - ROY E CLAVERIE upbound just below the Burlington highway bridge. This is another new boat for the Izona logbook! What a day! 8 - ROY E CLAVERIE Another view just below the highway bridge in Burlington IA. 9 - ANDREA LEIGH downbound just below lock 18 Mississippi River. Took a short, but rather important boat ride today! Tomorrow is Izona's 3rd Birthday! Hard to believe our little boat is 3 years old. I took this picture when we pulled into the bank just below lock 18. Miss Lucky had to report to shore for a business trip! Happy Birthday Izona!!!!! 11 - KEVIN CONWAY just below the lock 18 unloading liquid fertilizer. This is another new boat for the Izona log-book! Thought I better not get into the bank too close for this shot. Ya know, it's that rock, prop thing! Wish it was better! 12 - ANDREA LEIGH sitting in the fleet North of Burlington IA. getting ready to carry the Skipper to shore and pick-up a fresh one! OK, help me out. Is that a launch, a skiff, or am I clear off the chart? My Lori & Miss Lucky forced me to put Izona in the river today and take a short ride! Saw a few boats, but no new ones for the log book. C. MICHAEL REEVES upbound passing under hwy. 34 bridge in Burlington IA. 14 - BRUCE T lightboat working the fleet North of Burlington IA. 16 - BETTE-LYNN, BURLINGTON, TAYLOR B. Triple shot at Matteson Fleet! 17 - VIRGINIA INGRAM 11-19-07 shoving into the lock 18 ... sorry about the fog. 18 - LEXINGTON 11-19-07 at lock and dam 18. Again with the fog! Kathy, there coming your way! 19 - JEFFBOAT Hey Crew! Well, we had quite a day out on a foggy river in fort Madison IA. looking for the Badger! The first boat we found was the Jeffboat! 20 - DONNA RAE ... The next boat we encountered in the fog was Hall Towing's Donna Rae! Here it is! The Badger upbound just below Fort Madison IA. This is one of the pictures taken on 11/20/07 when we chased her down in the fog. Notice the missing name board on the port side! 22 - Another view of the Badger lightboat upbound as we passed downbound in Izona! 23 - Can you see the fog bank she is about to drive into? 25 - Well, here she is just above the Fort Madison draw bridge. Sad to think this was the last time I would ever see this magnificent vessel on the Mississippi river! We turned Izona about and headed for her trailer! 26 - PAUL B Canton Misouri Hey Crew! Sorry it has taken me so long to get my "road pictures" out of the camera! I stopped twice last week in Canton Missouri and shot a few boats! You all have the Paul B, so hit the delete button after you view the shot!! 27 - SIR DOUGLAS tied to the wall in Canton Missouri! 28 - BOB STITH I know "Big John" caught the Bob Stith in Quincy Ill, but here she is coming out of the lock in Canton Missouri on Thanksgiving Day! 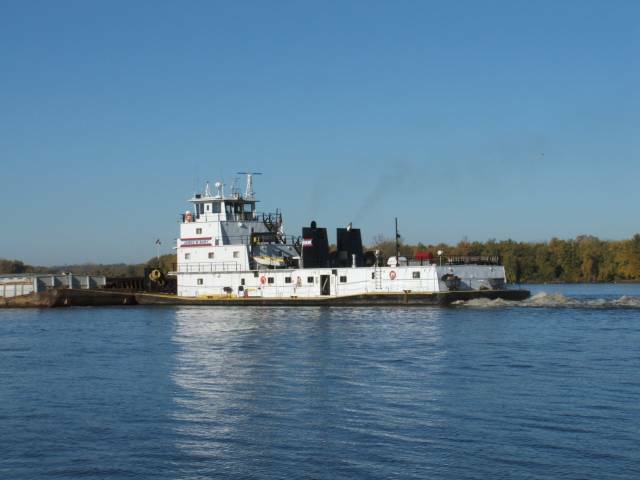 29 - BOB STITH downbound in Canton Missouri! Well, that was my Thanksgiving Treat! It was back to the interstate for the rest of the week!! 28 - Bout time you meet the crew on the Badger expedition! Left to right: Donald LaRue - Steersman! Jessica Kirby Runge - Acting Captain Steve Rowan - First Mate & Tankerman (we had two thermos' full of coffee) Tim Powell (not in picture) Picture taker! 29 - Jessica & Steve on forward watch! 30 - Donald at the helm! Hey Don, watch out for the buoys! 31 - That's Captain Jason Keesee in the white shirt! Not sure about the "Big Boy" next to him? 32 - Well, this is the last Badger picture I'm going to send. Sad to think this picture was taken with my Dad's camera who is no longer here, and the boat will go away as well. Dad went to a better place. Not sure about the Badger? This is just a teaser! I gotta get busy but I have to send one picture first! This is just one of the great pictures taken by our little Jessica while onboard Izona! Got your attention don't I? This was just below Fort Madison IA. today! 34 - Fog? - what fog?